Stroud: Sutton Publishing, 2000, Hardback in Dust Wrapper. From the cover: “The world in which we live is an increasingly dangerous place, subject to many widely differing threats that range from nuclear weapons proliferation to chemical and biological warfare, and from international crime to tribal genocide. 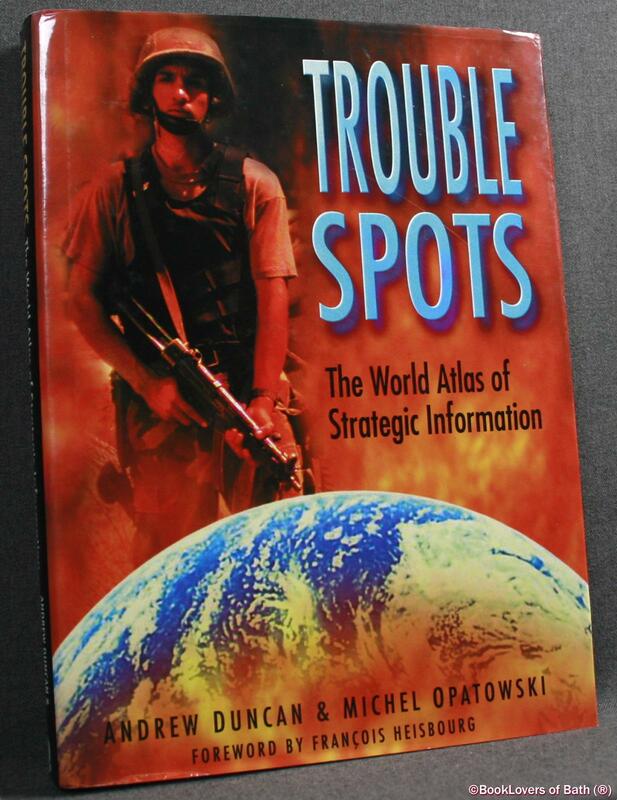 Trouble Spots explains, through concise authoritative text and clear graphics, the causes of conflict — whether it is currently in progress, in abeyance or imminent unless preventative measures are taken. Thematic problems such as global warming and weapons of mass destruction are reviewed, but Trouble Spots focuses mainly on unrest of a regional nature, such as in the Middle East, the Indian Sub-Continent, and in East and South-East Asia. Maps are used as a key to each topic, showing not simply the geographical features which influence military or humanitarian activity, but also the locations of the various factors contributing to the problem, for example population ethnicity or religious breakdown. The authors give a short historical background to each problem together with a summary of recent events and steps taken by participants and third or international parties to bring about a solution. They do not attempt to criticise or offer answers, but instead concentrate on the advantages and disadvantages of possible options. They also assess the likelihood of violence spreading from the area of original outbreak. The trouble spots considered in this book are not necessarily areas of military conflict: several issues with purely political and economic implications are covered, for example the availability of vital resources such as oil and water. Foreword or introduction by Francois Heisbourg. Size: 10¾" x 7¾". Black boards with Gilt titling to the Spine. [XII] 324 pages.